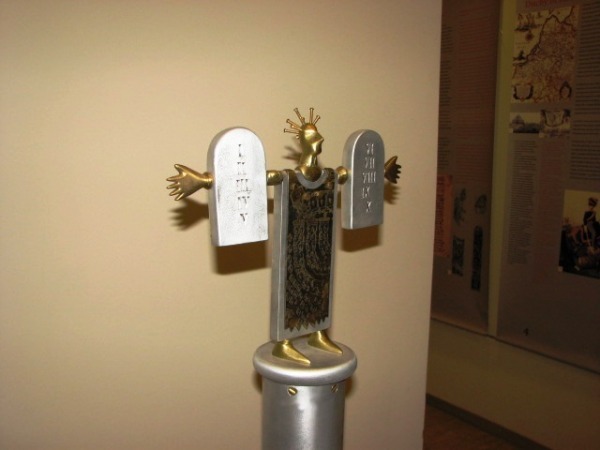 The collection of metal plastic objects „Telz“ is dedicated to the memory of Telšiai Jewish Community and the famous Telšiai Yeshiva – the traditional Jewish study school. Collection reflects on the diaspora theme. Text fragments from the Old Testment (The Book of Proverbs, The Book of Wisdom, etc.) are depicting the connection of the word with the meaningful past. Bronze, aluminium, cast iron, enamel and the other substances are combined in most of the works. Romualdas Inčirauskas was born in 1950, in Anykščiai, Lithuania. He graduated from the Applied Art Technical School of Telšiai in 1974.